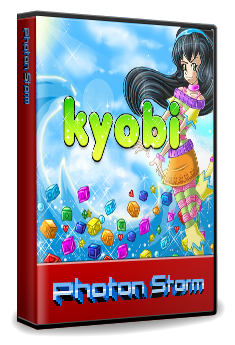 Kyobi is best described as a cross between Columns, Tetris and a Match-3 game, but with a big fat dose of physics thrown in for good measure. 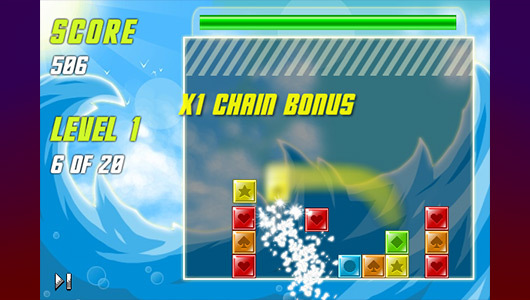 As the blocks drop you can grab them with the mouse, and fling them around. 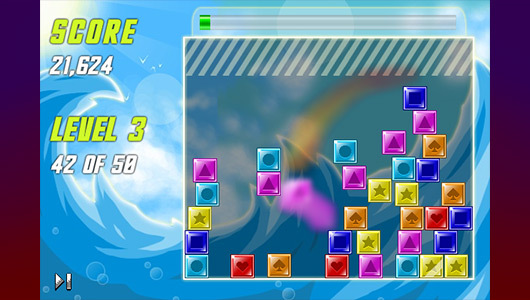 Match 3 or more of the same colour and they all explode in a shower of particles. 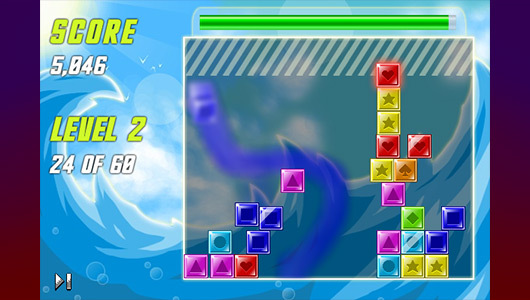 Throw them together with real force and you’ll shake the screen and score bigger points. 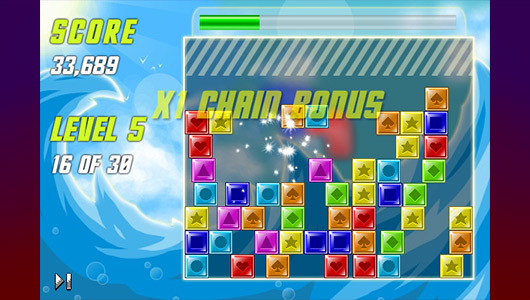 Chain combos can be obtained by smashing lots of colours one after the other within a set time. There is something very feng shui about the game. Watching people play is fascinating; some will try to organise the blocks into different stacks of colour along the bottom. Back in 1993 a small indie dev team called Digital Dimensions released a game on the Atari ST called Kubes. The object of Kubes was that as the blocks fell from above you could not control them. Instead when they landed you could slide the rows left/right, and by matching colours they would vanish. 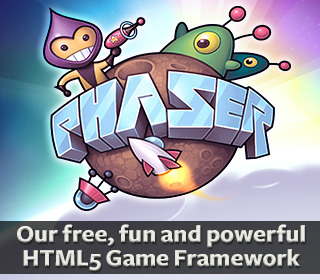 In concept this sounds quite fun, so I ported it to Flash. Early playtesting revealed that gaming times have moved on; and most people didn’t understand the row sliding mechanic and got frustrated by it. Not wanting to throw away the work I had invested into this prototype, I wondered what would happen if instead of sliding the rows you could throw the blocks around instead. Having recently completed a set of Box2D helper classes for PixelBlitz it didn’t take long to add this to the prototype. The difference was incredible. It took the over-used Match-3 concept and gave it a real shot in the arm. Kyobi is the end result of this work. 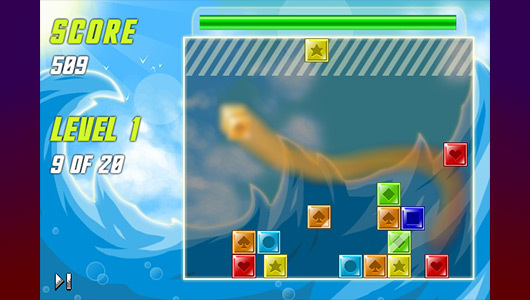 The game was actually still called “Kubes” right up until 2 days before I finished it. The title “Kyobi” doesn’t mean a thing, and isn’t taken from anywhere. I just made the word up (can you tell?!). I did do some quick Googling first to ensure it wasn’t something highly offensive or copyrighted. Total build time for this game was approx. 4 weeks worth of “spare time in the evening” during January 2009. I think if I could have worked on it all day full-time I could have finished it in 2 weeks. 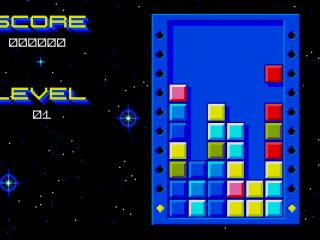 The blocks use my own collision system, not that of Box2D. 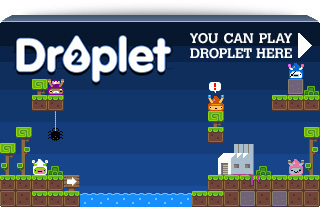 The hit test area for the blocks is larger than the on-screen graphic by 2 pixels on each side. This allows you to match 3s diagonally, and makes for a more interesting experience. If I could do one thing more to this game I would put in a variety of background images that change as the levels progress. But I spent my art budget already! 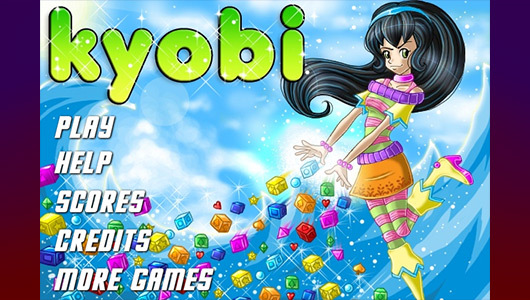 Kyobi was ported to the iPhone by The Game Creators. It was re-named to “Touch & Go” (don’t ask me why!) and the graphics re-done to make them more “finger friendly”. 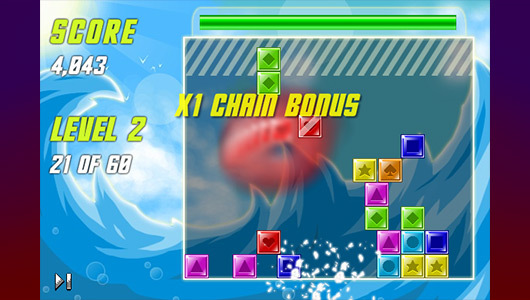 The iPhone version has extra level features like blockers and power-ups. It’s available from the Apple AppStore today in both full and Lite versions.